Everest Base Camp Trek Tibet – Walking on the world's highest trekking trail! We organize Tibet Everest base camp trek throughout the year but the best months for this epic adventure are April to June and September to November. 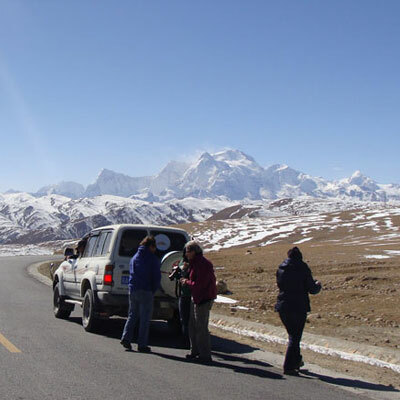 Moreover the first season, April, May and June are the best time for this trip because the weather in Tibet during these months will be so beautiful with the crystal clear sky and it is not even too cold, it’s really fantastic and pleasant time to do a trekking tour in Tibet. Tibet Everest base camp trek is one of our popular trekking tour packages that starts in Lhasa visiting the ancient palaces and monasteries and drive down to Gyantse and then to shigantse via tranquil Lakes crossing the breathtaking passes to Old Tingri from where the amazing trek starts with our trekking crew. This trip including a 4 day trek will starts from the barren valleys following the rugged trail to the world’s highest base camp from where you will enjoy the majestic view of Mt. Everest and its breathtaking range. Everest base camp trek from Tibet is probably one of the most adventurous and highest trekking trails in the world which is thoughtfully tailord for those adventure seekers who have dreamed of standing below Mount Everest, the top of the world and staring up at the world’s highest mountain towering above you! Doing Everest base camp trek is a great opportunity to live your dream and true experience the magic of Mount Everest. Trekking from Tingri to Everest base camp provides a heady mix of solitude, wildlife sighting and physical challenge and onagers and gazelle around the trail. We will complete 70 km trekking in four days and the route of this trekking is on the plateau with altitudes ranging from 4000m to 5350m. We will follow the most demanding yet rewarding trail to reach Rongbuk Base Camp. Magnificent view of Mount Everest can be seen clearly from the Rongbuk Base Camp along with the view of high ridge to the village of Zommug. We head to Everest base camp to explore the breathtaking glaciers below the massive north face of Mount Everest and to see the most magnificent scenery on the world’s tallest mountain peak. Day 01: Arrive in Lhasa (3650m) by train or by plane. Day 02: Guided tour of Potala palace, Tibet Museum, Jokhang Temple and Barkhor Street. Day 03: Guided tour of Drepung Monastery and Sera Monastery. 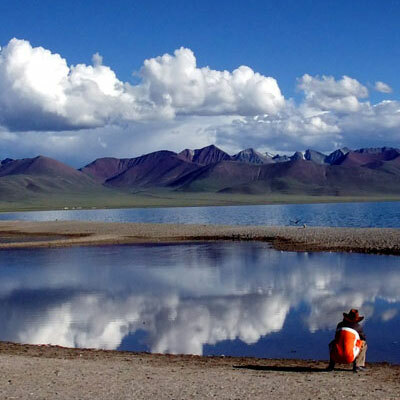 Day 04: Drive from Lhasa to Gyantse (3950m) via Yamdrok-tso Lake. Day 05: Drive from Gyantse to Old Tingri via Shigatse. Day 06: Trek from Old Tingri to Lungthang (4510m). Day 07: Trek from Lungthang to Lamna La (5150m). Day 08: Trek from Lamna La to Zommug (4790m). Day 09: Trek from Zommug to Rongbuk base camp and EBC (5150m). Day 10: Drive from EBC/Rongbuk to Sakya via Shegar and Lhatse. Day 11: Drive from Sakya to Lhasa. Day 12: Final departure from Lhasa. As an option, on the day 10 we can drive from EBC/Rongbuk to Nyalam and then next day to Kathmandu. Trip Cost: Please contact us. Day 01: Arrive in Lhasa by train or Plane. Upon arrival at the airport or train station, your Tibetan local guide will greets you and transfer to hotel in Lhasa. The rest of the time for you is to relax and acclimatize the high altitude of Lhasa. Overnight at hotel. Day 02: Guided tour of Lhasa- visit Potala palace, Tibet Museum, Jokhang Temple and Barkhor bazaar. After breakfast in the morning, we start visiting the world famous Potala palace and explore the grandest of this myriad chapels as well as its audience halls and enjoy the jeweled and golden burial Chortens of past Dalai Lamas and tremendous number of Buddhist frescoes, Hand painting Thangkas, combination of Mandala, etc… Tibet Museum is an essential window to introduce the magnificent culture of Tibet. Latter in the afternoon, we will visit the scared temple of Tibet, the Johkang Temple which is built during Songtsen Gonpo’s reign by princess Wencheng of Tang Dynasty, 647 AD and Barkhor Kora, also very Essential Street surrounding the Jokhang Temple. Overnight at hotel. 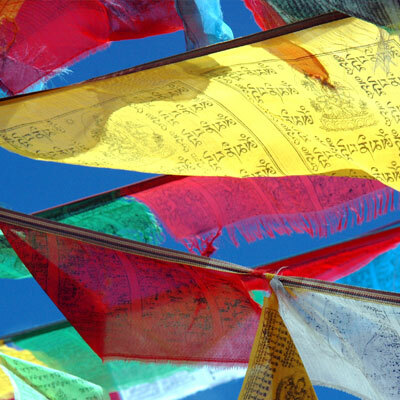 Day 03: Guided tour of Lhasa - visit Drepung and Sera monasteries. After breakfast, we start our amazing day visiting two very exciting and important monasteries of Lhasa, the Sera and Drepung. 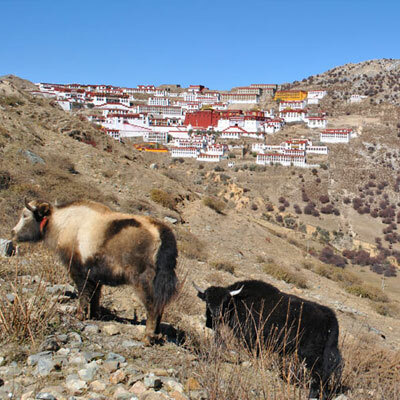 Drepung monastery is situated at the foot of a mountain and was founded in 14th century. This monastery was once home to 10,000 monks and Ganden Podrang in Drepung was famous for its role as the centre of Government during the fifth Dalai Lama and later relocated to the famed potala palace during the fifth Dalai Lama. In the Afternoon, we will continue visiting the Sera monastery which was founded in 1419. The attractions of Sera monastery in its Buddhist Scriptures debating held in the courtyard mostly around 4 to 5 PM every day. Overnight at hotel in Lhasa. After an early breakfast at hotel in Lhasa, we enjoy today’s drive by using the Friendship Highway, we will make our way to Gyantse, and reach Kambala La pass which is at an altitude of 4790m high. 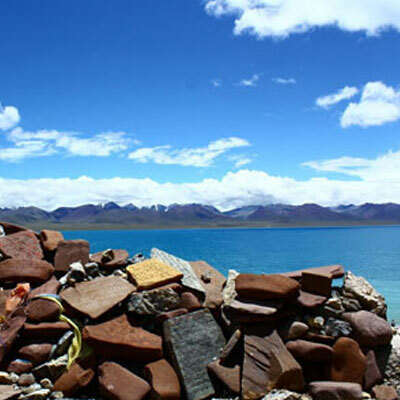 Overlooking deep turquoise Yamdrok-tso Lake from the top of the dramatic pass, we can observe the breathtaking shade of Yamdrok-tso Lake that resembles a coiling scorpion with deep blue in color. We continue our journey to Gyantse where we will visit the famous Stupa - Gyantse Kumbum, one of the most striking architectural attractions in Tibet. Overnight at hotel. As soon as breakfast fished we start driving to Shigatse which is only 90 km drive from Gyantase. We will visit Tashilunpo Monastery and the Spectacular tombs of Panchen Lamas in Shigatse. In the afternoon, we will head long Friendship Highway to Old Tingri via Lhatse and Shegar. 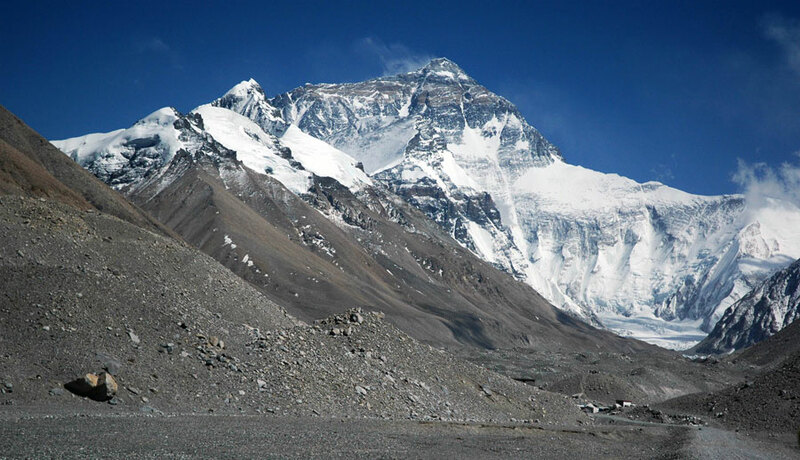 Our crew will do necessary preparations for the trek, while you may have a good view of Cho Oyu. Overnight at guest house. Day 06: Our trek start from Today, we trek to Lungthang (4510m) (5 hours, 12km, 150m up). After breakfast at guest house in Old Tingri, we start our first day’s trek from Old Tingri all the way to the Tingri Plain. The trekking trail will pass part of the Ra-Chu valley, we will see the beautiful valley scenery with extensive meadows and packs of sheep and goats. The rest of the day we can visit a small monastery in Chholun. This bleak region is home only to herders and barley harvesters. Overnight under tent. Day 07: Trek from Lungthang to Lamna La (5150m) (8hours, 212km /200m up). Breakfast will be at camp, the challenging trekking really starts today as we go up in to the mountains. Most of the time uphill walking will be done as we climb towards the top of Lamna La. Today, we will camp above the top of this pass. Overnight under tent. Day 08: trek from Lamna La pass to Zommug (4790m). After a cup of hot tea or coffee at a freezing place, we will descend steeply into lush vegetation. The trek will allow us to meet the indigenous yak herders and their families. Our camp will be pitched in the small village of Zommug. We are about to view the breathtaking sunset in this barren town. Overnight under tent. Day 09: Trek from Zommug to Rongbuk (4980m) and Everest base camp (5100m). Today is the last day of our trekking, after breakfast, we will wind our way to the final destination, Rongbuk bas camp and Everest base camp. 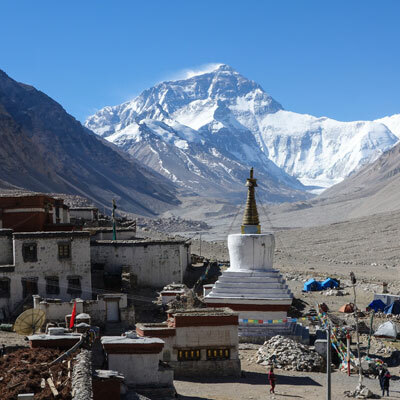 Along the way we can also visit the Dza Rongbuk monastery and Gompas which are remains of historical sites, yet with no comparison to our night camping at Everest base camp. Overnight under tent. Day 10: Drive from Rongbuk to Sakya via Shergar and Lhatase. After breakfast at EBC, we will have a short ride from Rongbuk to Lhatse, and then we follow the Friendship Highway back to Sakya. While driving we will relax by enjoying the Xiqian hot spring near Lhatse. Overnight at guest house. After breakfast at Sakya, we will take a visit Sakya monastery. The Sakya tradition inside Sakya monastery is one of the four main Buddhist schools in Tibet. It was from here that the whole of Tibet was governed during the period of Sakya hegemony and even now there are buildings of historic importance to be seen here. After visiting Sakya monastery, we will drive continue to Lhasa via southern highway. Overnight at hotel in Lhasa. Day 12: Final transfer to airport or train station. After breakfast at hotel, our guide will drop you off to airport or train station for onward flight. Private Jeep or Van or Mini Bus (depend on group size). Group visa notification letter and Chinese visa invitation letter. All the necessary pick up and drop with our service charges and taxes. Lunch and dinner while in the cities and drinks. Our website contains as much information as possible about Tibet Everest base camp trek. However, if you have any questions regarding trip, please feel free to contact us. We answer all enquiries within 24 hours. If you want to book a trip, you can send us an email or contact us directly by phone: 0977 98510 36844 (Ram Kumar Adhikari).